There's a jazz festival going on in Lagoa, near were I live, and I went to the first day and was blown away by the second group that played, "Fly Magic", so much that I went and bought the CD after the concert. It's not like the first group was bad, they were great too, but the other guys were just on a higher level. It was funny to see a few people leave the concert when one of the band members playing guitar started to do some really loud, sometimes not exactly harmonious solos, witch in my case just made me like them more. Honestly, I'm going to the third day of the festival, but I'll be impressed if it's anywhere near as good as the first day was. Anyone here who likes Maximum the Hormone as much as I do know any good songs from them that I haven't heard yet? So far, I have replayed the hell out of Tsume Tsume Tsume, F, Zetsubo Billy and What's Up, People?! Wow, you really are part of the traditional English upper class, huh. Not upper (my mum came from a country vicarage; my dad from the slums of Sheffield). But yes, I’m afraid to say I was somewhat privileged in my upbringing. Sorry about that, but there’s nothing I can do about it now. I am not upper class - to think I am is to fundamentally misunderstand the British class system. You don't graduate into the upper class. I suppose I scrape into the upper middle class. I fit Wikipedia's definition of it to a T, though - born in South-East England, arts professor for a father, boarding prep and public schools, Russell-group university (but I don't have a post-graduate degree). This stratum, in England, traditionally uses received pronunciation natively. (Also in the past called BBC English.) As do I, owing to the above background (and coincidentally having worked at the BBC for a time). But I don't show the characteristics which are typical of the actual upper class (landed gentry, one might call them). oh wow. I wasn't aware that social segregation is such a thing in the UK. (I looked up the Wikipedia) This is kind of a foreign concept... Austria is much more egalitarian in a sense - there's very little documentation about classes, tbh... and the social hierarchy that's in place is much more fluid. New Deafheaven is out; it's great, as to be expected of one of the bands that have become one of my evergreen favorites, a la Converge, Interpol, Deftones, Radiohead, et cetera. It's heavy but never becomes overly taxing to listen to, almost lite instead, much like Roads to Judah but more melodic instrumentals. I know Sunbather is acclaimed as their best work, but I think this one does the same structure, but much better, with the interlude tracks and such between the actual songs. About an entirely different Third Child, but at the sametime somewhat appropriate. I know that deep in my heart of hearts I like most heavy metal bands and while I have a love/hate relationship with the Mexican band Brujeria (their former guitarist plays guitar in Fear Factory), I heard an old song of theirs that has me wondering whether I should keep supporting them or not called "Matando Gueros". Yesterday, I picked up the Beatles anniversary edition on vinyl, which is 4 discs, 2 being the original album remastered by Giles Martin (George Martin's son) and the other 2 being the Esher Demos (recorded in George Harrison's apartment) of the album. The Esher demos are pretty cool, it's like the entire album but acoustic. I've been listening to the new single of Grimes, which is as frosty and catchy as one would expect, but also so layered its weirdness it extends to a meta level. It's floating? How the hell is that even possible? Magnets, judging by the label on the front. ^That came across my mind too, but wouldn't it take a lot of power to do that? Heh, it's interesting how designer of this… apparatus imposed the impression that there the whole plate is one big, massive magnet. cyharding wrote: wouldn't it take a lot of power to do that? To make a number of small, yet very strong magnets? Probably, but it's producer who pays the bill. My guess is that some electronics controls pulsatory electric current in coils embedded in the basis, so that the mangetic field produced can periodically pull or push the magnets in the plate. Stability? Most probably there are sensors which keep detecting parameters of motion of the plate and their signals are used to close the feedback loop. Just don't ask me what code exactly is run by the microchip. I believe it's a circular neodymium magnet that's in the platter, it's not super crazy strong but it is pretty heavy. When putting it together I had to put it on my table and it grabbed onto the steel poles under the table. I think there are actual moving parts in the mechanism below the plate because I can hear them move, it's actually louder than you'd expect. 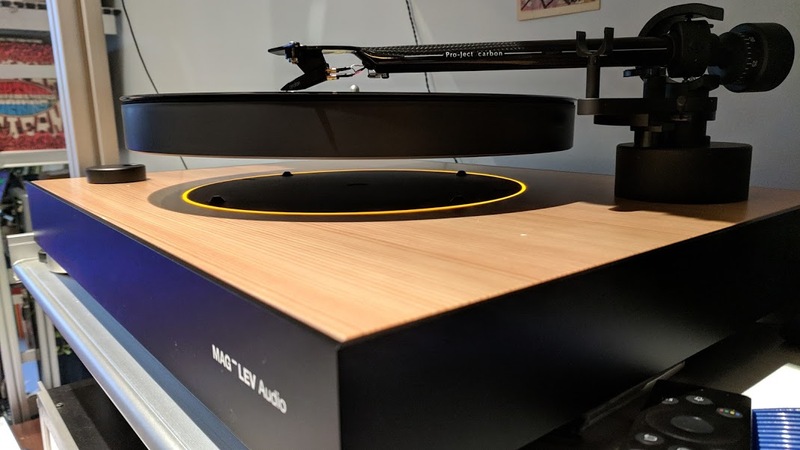 It takes like 10 seconds or so for the platter to spin up to a 33rpm (and likewise to spin down to a stop), so it isn't like there's a strong magnetic field that fixes the plate to an axis. The field seems more to lock the plate in a fixed position and then something else, like a weaker field, makes it spin. When it's not spinning, there's 4 little legs that come up to hold the platter so it doesn't need magnets. When the thing is spinning, it's a *real* bad idea to try to mess with the plate as it starts to oscillate on a specific axis and it can damage the needle, and probably other things.